Another good young band that’s also on the Eleven Seven Music label and has a similar garage rock sound to label mates The Last Vegas, though they are less glam and more blue. I’m ashamed to say I hadn’t even heard of this Baltimore-based band until it was announced they would be playing at Crue Fest 2, but thanks to the wonders of MySpace, I got hooked on the band and pre-ordered this album. The album is a satisfying release, with only “Almost Home” grating on my nerves as its an obvious attempt to have a ballad played by the modern hard rock stations. Any number of bands could have performed that song and it seems out of place considering the swagger and bravado of the rest of the album. 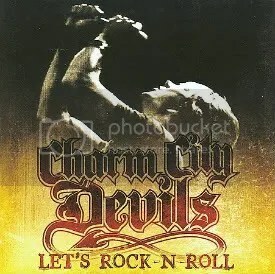 Where Charm City Devils really shine is on “Let’s Rock-N-Roll (Endless Road)” and “True Love (Hell Yeah)”. Both songs are amazingly catchy. Even though the old school hard rock blues influence is there, I could still see “True Love” getting some radio play. It’s a great, simply song that I find myself stomping and singing along to every time I play it. John Allen’s vocals have really impressed me. He sounds a lot like Steelheart singer Miljenko “Michael” Matijevic, who is high praise because Matijevic has one of the best voices ever in rock ‘n’ roll, I think. Anyone who is a fan of down ‘n’ dirty old school hard rock owes it to themselves to check this band out.